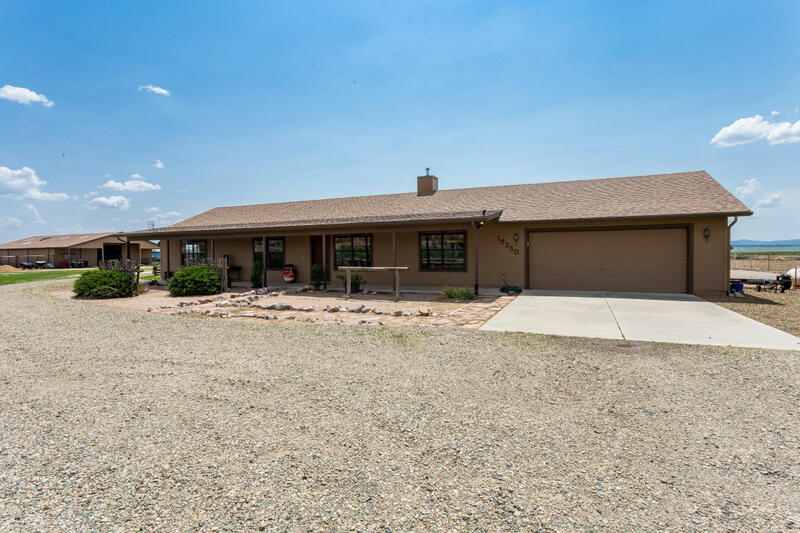 Located in the rolling foothills of central Arizona, this wonderful 36-acre ranch offers country living just 30 minutes from Prescott. Crossroads Ranch is nestled along Mint Wash in an area known for its ranches, horse properties, elbow room and abundant groundwater. This well-maintained ranch style home offers 3 bedrooms and 2 baths with a cozy great room centered around the large hearth and pellet stove. Vaulted ceilings and upgraded touches highlight the wonderful kitchen and breakfast nook. This property features a spacious 6-stall, 2400 sq ft barn with 10x12 tack room, feed room, hot & cold water, chicken coop, lights, horse walker and 4 mare motels. There is plenty of room for an arena. This is a stunning ready-to-use property that features a very strong well.